Meet and greet in Tokyo's Narita Airport (NRT) at 5pm or the Gate Hotel Asakusa at 7pm (more information on meet up locations, here) We'll wait at the airport for all our arrivals before hopping in the van and heading to our first destination: Tokyo. After checking into the hotel and having dinner, we take local trains and check out Tokyo’s neon night life. We visit districts including Shibuya and Shinjuku with their “Lost in Translation” style Karaoke boxes and bars stacked on top of each other like Legos. If you're up for a night on the town, you can easily keep yourself entertained here for as long as you want. See you in the morning! Today is a full-day exploration of the city of Tokyo. Our tour will take us to Tsukiji fish market, on a bay cruise of Tokyo Bay, to a peaceful tea garden, Tokyo's most famous Buddhist temple Senso-ji, and to a Shamisen performance. Note that the Tsukiji fish market is changing in November 2016 and we're not really sure what is' going to be like after the update--but we'll see! After a full day, we pack up the van and head to our first ski destination—Hakuba. It’s a hotly debated question—Hakuba vs Niseko, which is better? Both have their strong points and today we see exactly what Hakuba’s strong point is—big mountain skiing. An annual snow fall of 11 meters, big mountain terrain, some of Japan’s lightest snow, and excellent evening dining and night life options make Hakuba one of Japan’s best. Hakuba is a general name for an area consisting of 6 different resorts. Even within the short distance of these resorts, there can be significant variation in the amount of snow and each day, we aim to ski the one with the best pow. On our 2 ski days, we'll choose from Cortina, Happo One, Tsugaike, Hakuba 47, Goryu, and Norikura Onsen, to name a few. On our last Hakuba day, we'll be exploring the Hot Springs Monkeys, having lunch at a 260 year old Sake Brewery and then catching the bullet train for our next destination--Kyoto. 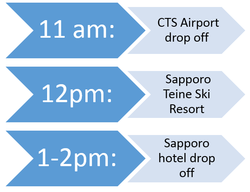 *Note that the three days in Hakuba will not come with an on-mountain ski guide. For these three days your facilitator will drop you off at the hill and arrange a meeting time at the end of the day. By contrast the 8 days of skiing in Hokkaido will come with a ski guide. Hosting 17 Unesco World Heritage sites, more than 1600 Buddhist temples and over 400 Shinto shrines, Kyoto--the ancient capital of Japan--is a sight not to be missed. Not only is this city the traditional heart of Japan, its where the Japanese go to learn about their own origins and culture—which makes it a superb place for foreigners to do the same. We spend a full day touring Kyoto by bicycle visiting the southern and northern Higashiyama districts and Fushimi area. The Higashiyama district contains the thickest concentration of worthwhile sights in Kyoto including Kiyomizu-dera, Heian Jingu, and Ginkakuji. In Fushimi, we'll visit the #1 voted sight in all of Japan as well as the birthplace of sake brewing. We work up a hefty appetite from our day traditional immersion and indulge in exquisite locally available cuisine from one of the many alley ways of Kyoto. We leave Kyoto early in the morning and fly the two hour flight to Sapporo; the closest airport to Niseko. We arrive in Niseko via "the adventure van" around 1pm. Our lodging is located in the Niseko-Moiwa resort area and is a western style hotel with ski-in access. The Niseko United resorts of Annupuri and Hirafu can be accessed easily by shuttle along with the downtown bar/restaurant area. More information on this trips lodging can be found here. More than just skiing the Niseko area, Niseko serves as a great base from which to access Rusutsu and Kiroro--lesser known and very fun areas to ski. After a full day, choose from one of the many food options then melt into the outdoor hot springs. We arrive in Hokkaido’s best kept ski secret—Asahikawa. Unlike Niseko and Hakuba, Asahikawa isn’t frequented by foreigners and maintains a traditional Japanese air about it. Asahikawa isn’t a resort, it is a centrally located city with easy access to three different resorts which get vastly varying amounts snow depending on what the weather is doing. From our central location, we’ll storm chase the best possible snow we can get depending on what the weather is doing that day. And that’s not all. If you can believe it, the snow in the Asahikawa region is even lighter than anywhere else in Japan including Niseko. The area around Asahikawa is truly the crème de la crème—the best of the best lift access snow on earth. Your return flight from Sapporo's Chitose Airport (CTS) is NOT included in this trip. You'll need to make your return logistics on your own. See our Logistics Page for further details.